The 1980's. A decade with Folk out of fashion and the band having young families to raise or lots of outside business interests. 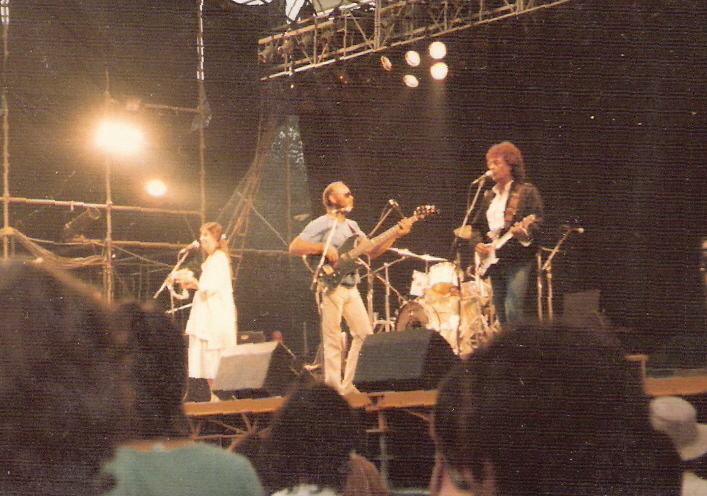 The Band reformed in 1980 after its only period of non-existence and the early 80's especially was never more than a part time job for the members. They still managed to tour the UK every year apart from 1983, released 3 studio albums and had multiple tours of Australia and the US. Without doubt the hardest period to get information and there are a few gaps. Rumours of a return started around this time in the press. 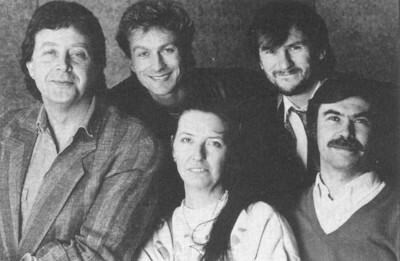 Chrysalis Records approached Maddy and Rick to return for a new album after Warwick Records had approached Chrysalis to Licence a 'Best Of' collection for them to sell via their normal TV Advert route (which never actually happened). Chrysalis realised that with the interest and free advertising this would generate, that an album of new material would sell well along side it. They were only interested however if the classic line up returned which meant Maddy and Rick reaching out to the rest of the band. The band themselves were struggling with Solo efforts, with none being as successful as they would have liked. This offer gave them the opportunity to explore their own songwriting in a band setting that had a better chance of success. They also decided that it would be a shame not to tour with the new album. Apparently the the band wanted Mike Batt to produce new album but he was taking 2 years off music, sailing around the world. They got in Gus Dudgeon, long time producer for Elton John. 20th: Torquay - Harbour side. 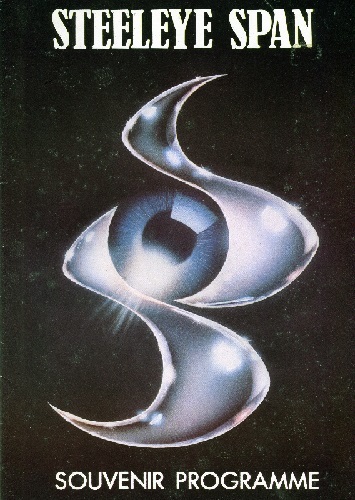 Per Poster. 1st Appearance Back? 1st: 'Maddy Prior Band' Single - Wake up England(Kemp)/Paradise(Prior) (EMI). Did not appear on any album and is 2 years before the 1st 'Maddy Prior Band' Album, which was not on the EMI label. So it was a bit of a curious release. 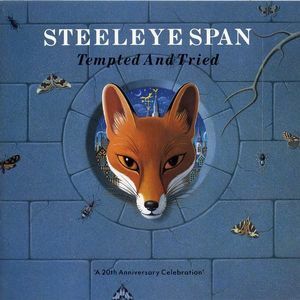 Whether it was released to latch-on to the Steeleye relaunch, or was actually an already committed to single, and a potential album was aborted because of the Steeleye re-launch is not known. Not available on any collections. With the return of the Classic line up the band for the first time released an album of mainly original compositions. As Maddy said: "What we came up with reflected traditional themes, yet sounded contemporary". 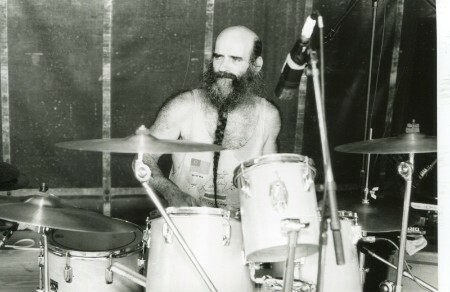 When the band first practised Gus Dudgeon did not think the songs were strong enough and so sent them off to write some more. Tim Hart said that they were at one point one track short and so he went off into a little studio to finish the words to 'My Love' so they could add it to the Album. Rick did the same with 'Where are they now', sitting up all night to finish it the day before recording. 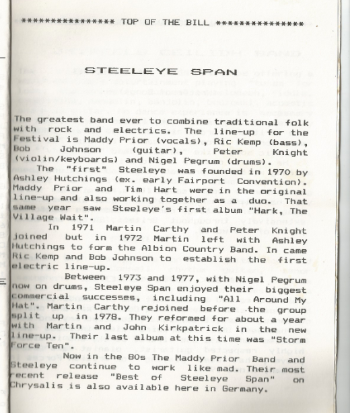 The Tim Hart booklet, 'The Complete Steeleye Span', was given with initial purchases of the LP at HMV. 1.Sails of Silver 2.My Love 3.Barnet Fair 4.Senior Service 5.Gone to America 6.Where are they Know 7.Let Her Go Down 8.Longbone 9.Marigold/Harvest Home 10.Tell me Why. Bonus Live tracks from 1996/7 on CD reissue: 11.Thomas the Rhymer 12. My Johnny was a Shoemaker 13.The Lark in the Morning. 20th: BBC2 TV: 'Jake Thakray and Songs'. Guest Appearance by 'Maddy Prior Band' on one of these 6 episode series. Recorded at the Hare and Hounds in Kings Heath, during 1980. The episode is still held by the BBC and Jake's songs from it have appeared on a collection DVD but not sadly this guest appearance by Maddy. It is not known how many songs they played but the guests usually did 2 or 3. 30th Glasgow Apollo. £3.75. Up from £1.50 in '75 & '78. Last appearance at the Apollo. 25th London, Barbican Bank holiday with Akimbo. Vienna? Newspaper article in April says they will be Vienna after a 'series of gigs at summer festivals. 31st July Cambridge Folk Festival. Recorded by BBC and tracks were played on Radio 2's 'Folk on Two' programme (3rd Sept '81 & 29th March '82). In total the following were broadcast in the UK: All Around My Hat; Cam Ye; Long Lankin; Royal Forester; Gaudete and Senior Service. The latter can be found, in particularly good quality, on Youtube - LINK) . 'Hat' can be found on a Cambridge Folk Festival collection CD, the others on Bootlegs. Black Jack Davy; Two Magicians; Saucy Sailor; Longbone; Sir James the Rose; Thomas the Rhymer. Part 2: Sails of Silver; Long Lankin; Cam Ye (not broadcast in Belgium so not sure of order); Senior Service; Royal Forester; Encore: All Around My Hat; Gaudete. Included Cam ye o'er Frae France/All Around my Hat. 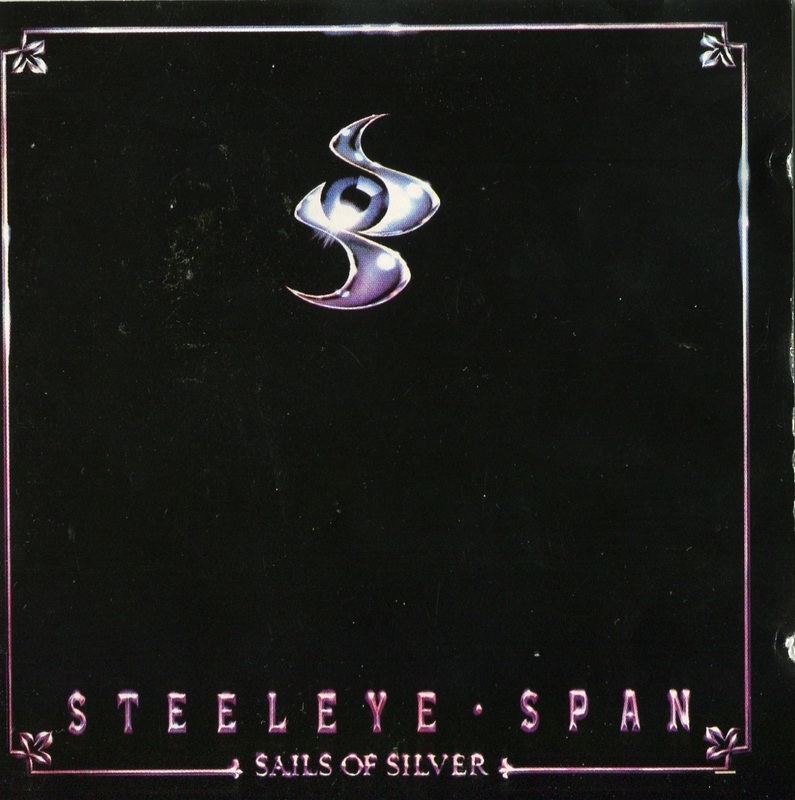 A short video clip was shown on the 2005 BBC Folk Awards when Steeleye were awarded the Good Tradition Award so all the footage should still exist somewhere. 18th BBC TV: Pebble Mill at One. 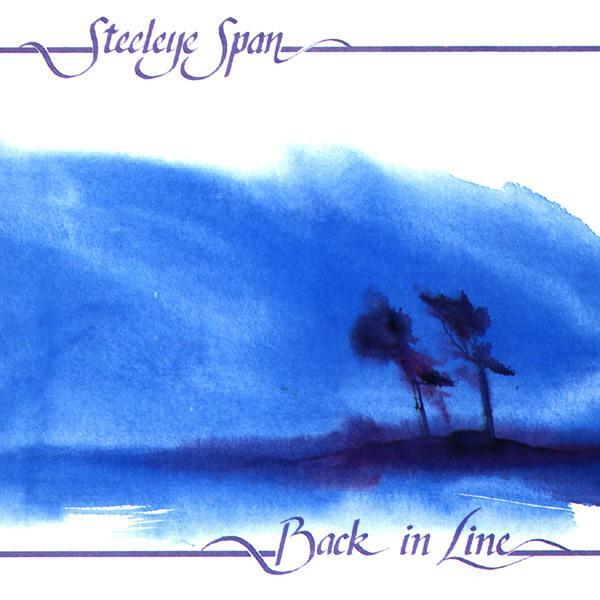 Appearance by Steeleye Span. Performed 'Saucy Sailor' . Pete's pickup falls off his violin at the climax of the song for a few moments! 27th BBC2 TV: ' The Other Music'. 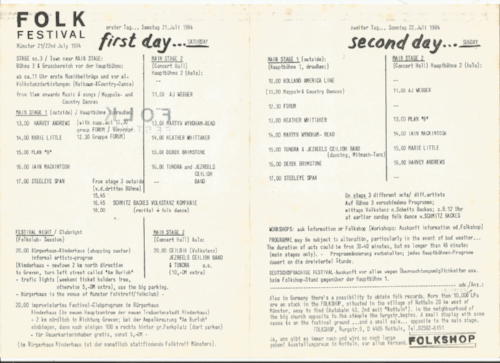 Documentary about The folk revival from 1945 to now. 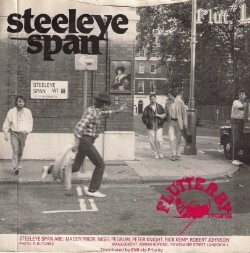 Not sure what is shown but Steeleye Span definitely featured. This TV series (plus LP) features Scottish presenter and singer Isla St. Claire singing traditional songs backed by members of Steeleye Span (band not on screen) - Rick Kemp and Nigel Pegrum. 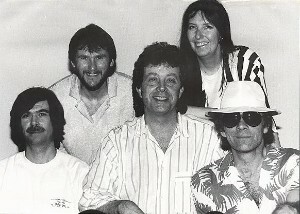 It also features Richie Close who was part of the 'Maddy Prior Band'. Some songs can be seen on You Tube. Not a Steeleye release, and although the 'Friends' were many, it included Maddy on a most songs, along with Rick on Bass, Peter on Fiddle and Bob on vocals on a couple. 11th Assembly Rooms Derby. Date per Chas Gilbert so likely to be a tour. Set list: The King; Black Jack Davy; Sails of Silver; Let Her Go Down; Alison Gross; Barnet Fair; I have a Wish; Gone to America; Longbone; Bach goes Limerick; Little Sir Hugh; Thomas the Rhymer; All Around My Hat; Gaudete; Royal Forester; Sligo Maid; Cam Ye O'er France. 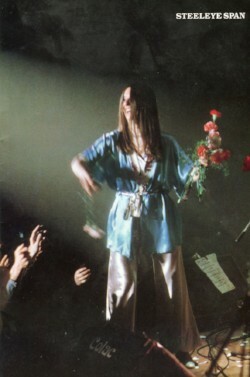 On Tour album recorded during the Sound Check with the Audience applause then dubbed in. One of the two Adelaide concerts was then recorded and played out in full on Australian Radio on 28th December on ABC-FM. The Maddy Prior Band' release album 'Hooked on Winning. (Kempire Music) The Album features Rick Kemp and is mainly original songs written by Rick and Maddy. I think it was released on Nigel Pegrum's own record label - Plant Life in Australia. It was Maddy's first 'solo' album since the two with Chrysalis back in 1978. 14th August: Cropedy Appearance for 'Maddy Prior Band'. A DVD of the weekend ('A Peculiar Old Weekend') with the band singing 'Love's not just a Word' is available. It is also on YouTube 'HERE'. They are at 7 minutes in. "Over a dozen European Festivals"/European Tour? There is a T Shirt that is printed "European Tour 1982" that was for sale on Ebay. No dates on it. 20th Aug: 'Billingham Town Centre' 'Folklore festival, Cleveland. Australian Tour?? One mention of it but no evidence. 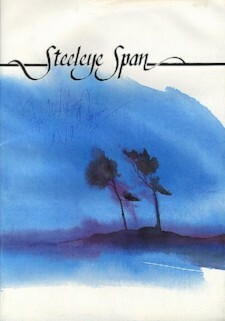 An LP only Australian release recorded on Steeleye's 1982 tour of Australia. 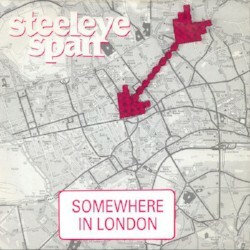 Fortunately most of the tracks were later released on the 2001 CD: 'Gone To Australia (1975-1984). 'Maddy Prior and the Answers' Album: 'Going for Glory'. Again a set of original Rick/Maddy songs. 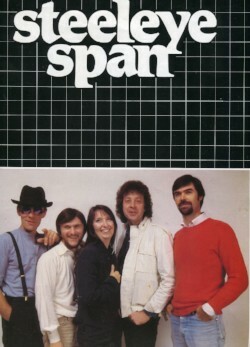 This time a new band name (albeit with virtually the same band) and a new label - 'Spindrift'. The 'Friends' included Maddy and Rick again but not Bob or Peter. There was a Promo video made for 'Drunken Sailor' (the picture of three on the cover is from it) which was on Youtube for a number of years but sadly seems to have disappeared. A busy year touring UK, Australia and US. 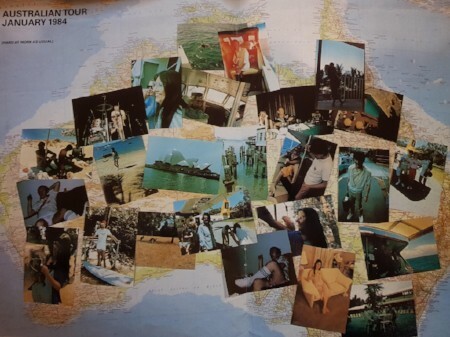 The 4th tour of Australia. And the bands first ever tour, or even appearance, without Tim Hart. After a two year break the band introduce 3 new songs - Lady Diamond & Scarecrow which will make their way onto the next album in 1986, and the 'Autumn to Spring Medley', which available on the 'Rare Collection 1972-1996' CD. 11th Fairfield Halls, Croydon. 6 tracks played from this tour on 'Folk On Two' on 17th Dec '84. Royal Forester; All Around My Hat; The Drunkard (Maddy a capella); Thomas the Rhymer; Gone to America; Jigs. Finally Returning to the US for their 6th tour. 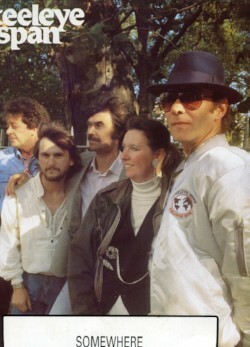 The tour was tied tied to the fact that they had just signed to US record Label Shanachie who probably promoted the tour. No new songs appearing in the set list around this time but a continued re introduction of old songs with less reliance on Sails of Silver album. Bach Goes Limerick; Black Jack Davy; Longbone; Bachelors Hall; When I was on Horseback; Hard Times of Old England; Thomas the Rhymer; Marigold/Harvest Home; The Spring Will Bring us Together; Blackleg Miner; Let Her Go Down; Cam Ye O'er Frae France; Lady Diamond; Royal Forester; All Around My Hat; Gaudete/Jigs/Gone To America. 26th Venues hard to make out from photo. 4th Bottom Line, NY Thanks to Hugh, who was at one of these shows, says Brown Girl was played, and so similar to Adams Theatre above, they mixed up the set when playing the same venue more than once. 13th-15th Bracknell Folk festival. Incl Dave Swarbrick, R Digance. 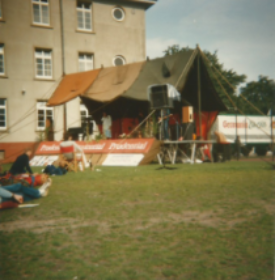 21st & 22nd July: British Forces Folk Federation: International Folk and Music Festival. 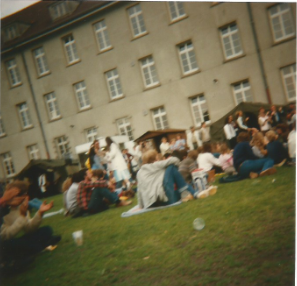 Edinburgh School, Münster, Northern Westfalia. Steeleye Headlined for two days. Thanks to Roland who told us about the Festival, the Radio show and has provided some great visual reminders. The show played half an hour of songs from the show: (The actual festival included Scarecrow.) Black Jack Davy; Spotted Cow; When I was on horseback; Autumn to spring medley; Hard times of old England; All around my hat. 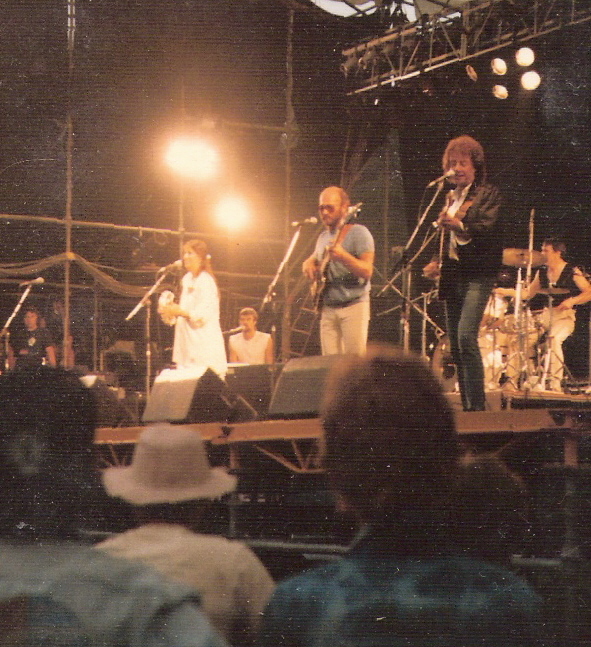 The only time I have seen a summer Steeleye Tour, this tour seemed to be worked around some festival appearances. These tour dates are mainly thanks to Chas Gilbert. 24th Schoten, België, Small festival with support - De Nieuwe Snaar. 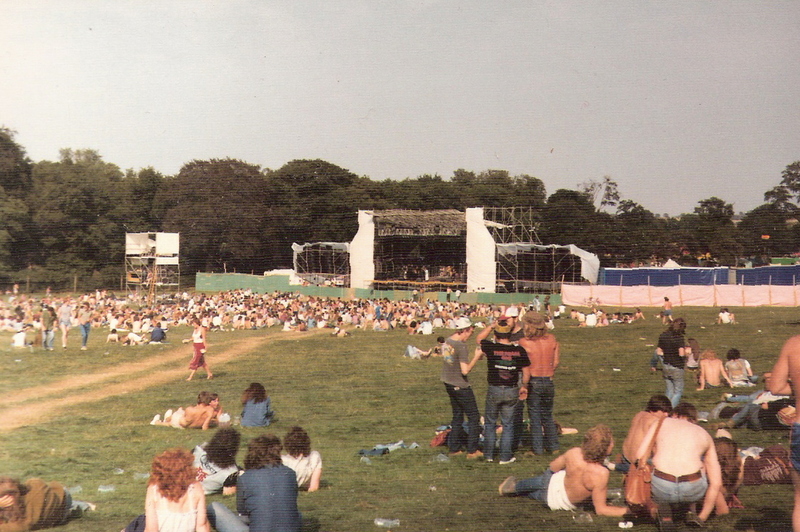 26th Nostell Priory Festival, Wakefield. Other acts incl. 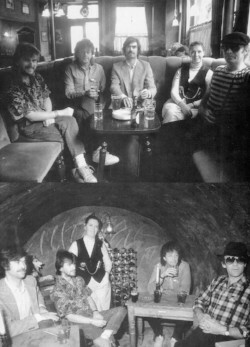 Van Morrison, The Band, The Damned, Marillion. 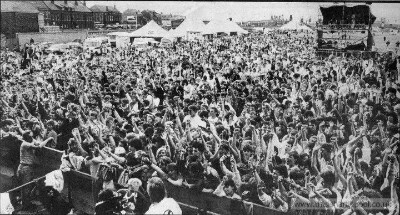 This was around the time of the Miners Strike and the festival had let the local Striling Miners in, so Maddy did an anti Thatcher rant and then they played 'Blackleg Miner', as they frequently did around this time. They dedicated it to the Miners which was sometimes controversial depending where they played it! At this festival they did not play 'All Around My Hat', which was unusual. Many thanks to Eddy Bewsher for the information and for use of his photos below. 17th Dec: BBC Radio folk on two. Presented by Jim Lloyd, With Martin Simpson. Tracks played from the Fairfield Halls concert (Croydon) from 11th March: Royal Forester; All Around My Hat; The Drunkard; Thomas the Rhymer; Gone to America; Jigs. 11th: Gloucester Festival. Headlined. Set list included: Hard Times Of Old England, When I Was On Horseback, Thomas The Rhymer, Blackleg Miner, Spotted Cow/Reels, Let Her Go Down, Isabelle. 21st Nottingham, Theatre Royal. Recording of Blackleg miner for 'Back in line' album. They sang 'Somewhere in London' and 'In The Bleak Midwinter'. I say 'sang', It looks mimed. It is also on Youtube. Sadly it is very much 'of the 80's' and I can't yet face linking it directly! 28th May BBC Radio 'Folk On Two' Session. See 'BBC Sessions' page for full details. Released on the Flutterby label, one effectively owned by members of the band. It marked 6 years since the last release of new material, the most in the bands 50 years history so far. Mainly original compositions by Rick and Maddy who were working as a duo & in a band at the time. Vince Cross on DX7 (synthesizer) was a session musician listed on the album. UK Tour 'Back in Line' (15 dates). Advertised as 'Back in the Studio, Back on the Road'. Support Bill Zorn & John Benns. Recording of songs for 'In Collection' Live album. .
9th Newcastle City Hall. Tickets £5. 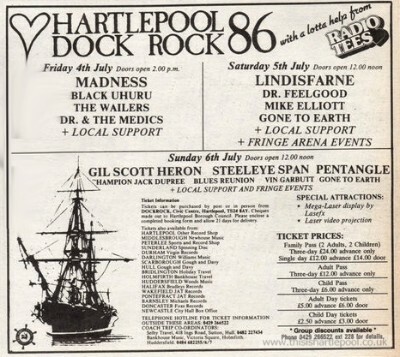 4th-5th 'Hartlepool Dock Rock'. Including Madness, Lindisfarne; Doctor Feelgood. Up to 60,000 expected. 24th Aug: Bank Holiday. Royal Festival Hall, London. It was noted in the article that the band were returning to Australia and the US later this year., but I have not seen anything about a tour in the US. Another tour of Australia, their 5th so far. ?? Tweed heads, NSW. Apparently the PA system broke so Maddy ended up singing sat in the audience at one point! 7th Appearance on Network 9 TV: 'Ray Martin Midday Show'. Singing 'Lady Diamond' Live in the Studio. See 1st Video below! City Hall, St Albans. Rick still playing. Played a song called 'Pheonix'. Name of song per Nigel P.
Rick Kemp (Bass) leaves band. Due to shoulder injury preventing him from touring. Mark Williamson (Bass) replaces Rick Picture below with Mark is from fRoots interview in 1988. He did not appear on any recordings/albums. Adelaide Opera House Per Bootleg, but seems likely to be 1986. 25th Barbican Theatre London w.Akimbo. Mark Williamson was with the band on this tour and in Cambridge sang a song for the first encore 'All I have to do is Dream', I don't know if he did every night. 30th Aug. Philli Folk Festival. 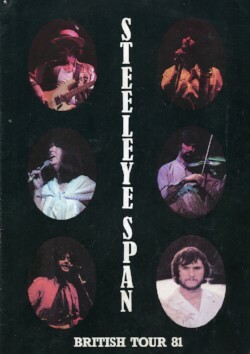 Video below from this concert, rare chance to see Steeleye live in the 80's on video. (more available on Youtube from concert). 2nd Sept. Nightstage, Cambridge, MA; Padstow; Lady Diamond; White Man; Isobel; Take My Heart; Canon by Teleman; Betsy Bell & Mary Gray; Hard Times of Old England; One Misty Moisty Morning; Cam Ye O'er Frae France; Encore: All I have to do is Dream; All Around My Hat; Jigs; Blues Jam. 9th Birchmire. Per Bootleg: Padstow; Sir James the Rose; 4 Nights Drunk; The Blacksmith; White Man; Let her go Down; Wee Weaver; Canon by Teleman; Betsy Bell & Mary Gray; Take my Heart; One Misty Moisty Morning; Lady Diamond; Cam Ye all Frae France; Hard Times of old England; King Henry. Detailed Simon Jones Interview with Maddy Prior in fRoots. Maddy said 'we have Chris Staines in the band now.' In other later interviews it has been said that Mark and Chris only did one tour each but I suspect that it was not that simple. Rick and Maddy toured in the Spring as a duo. Silly Sisters (Maddy Prior and June Tabor) Album: 'No More to the Dance' (Topic Records) 2nd and last Silly Sisters Album which was accompanied by a Tour. 'end of 1988'The Pavilian, Hemel Hemstead. Tim Harries (Bass) join the Band. joined "2 weeks before a tour" and in 'early 1989'. 10th: SINGLE: Padstow (Flutterby Records, distributed by EMI). Written by Maddy Prior. There is a small question mark over whether it was actually Chris Staines who played Bass on this track. 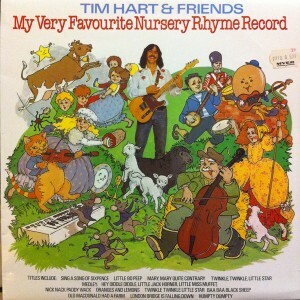 It would have been tricky for Tim to join and have time to record this single in time. We also know that the band did have some recording sessions with Chris which had to be shelved, or so it was assumed. 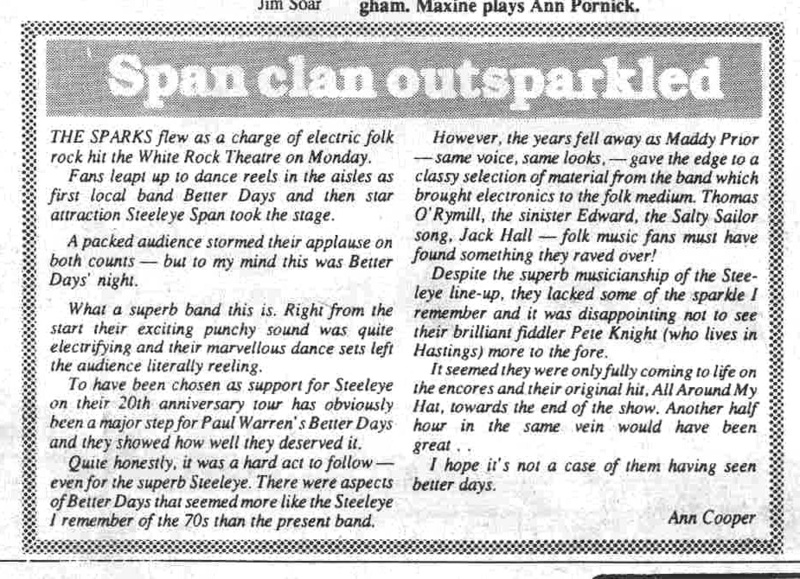 Many thanks to Paul Dengate, guitarist from Better Days who kindly sent the dates/Flyer for this tour as well as a review of the concert at the time and a photo (below) of Folk Rock band 'Better Days' in action. 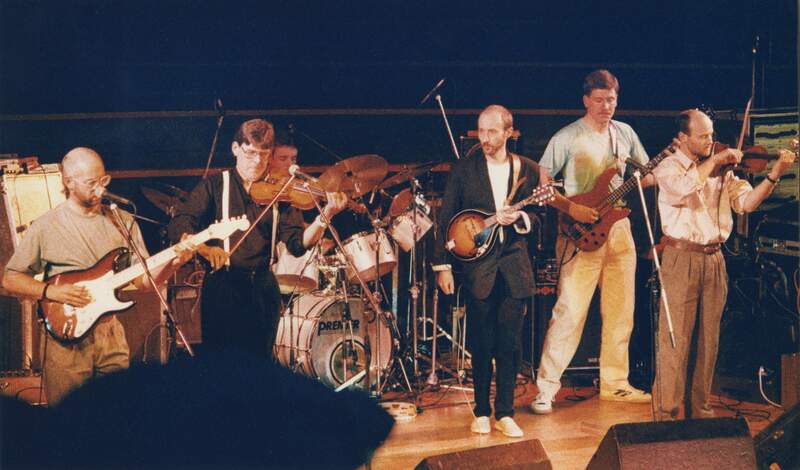 The band had fiddler Garry Blakeley who supported Steeleye on other occasions and currently plays with the Feast of Fiddles Tour. Band Signs to Dover Records, an arm of Chrysalis. 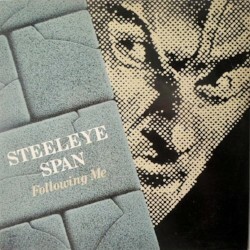 SINGLE: Following Me (Dover Records), Written by Peter Knight. A new Album made to celebrate the band 20th Anniversary. A mix of traditional and original tracks, 3 each by Bob and Peter. This was Nigel Pegrum's last album. It guested Martin Ditchum on 'extra percussion'. Maybe because Nigel left before the album was 100% finished. 1. Padstow. 2. The Fox 3. Two Butchers 4. Following Me 5. Seagull 6. The Cruel Mother 7. Jack Hall 8. Searching For Lambs 9. Shaking Of The Sheets 10. Reels: The First House In Connaught, Sailor's Bonnet 11. Betsy Bell And Mary Gray. Leaves after recording the album and does not tour. Goes to live in Australia having been in the band 15 years having been their only full time drummer. Liam Genockey (Drums) Joins the Band. Previously worked with Peter Knight and they both lived in Hastings at the time. "Tempted and Tried, a 20th Anniversary Celebration" Tour. 15th Sept. Croydon - Fairfield halls. Liam's debut. Tracks from this played on BBC Radio 2.
from the Fairfield Halls, Croydon. Repeated in 'Folk On Two' 7th February 1990 but may have been different tracks.